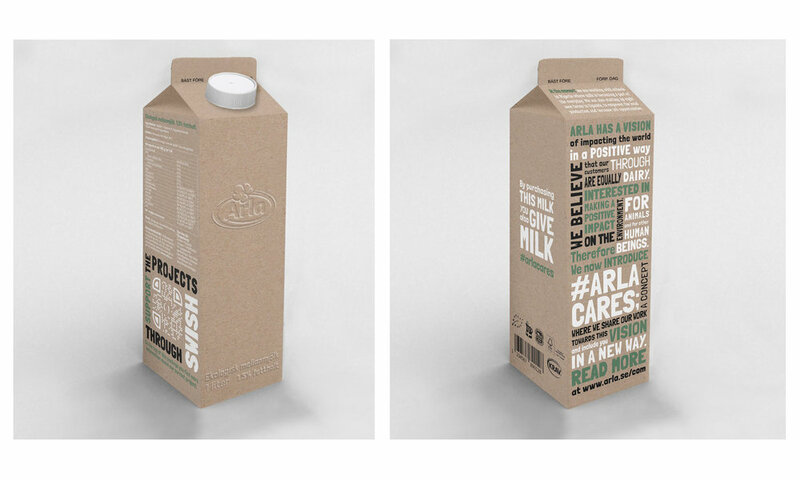 Packaging design challenge and concept for Arla by Lisa Liljenberg and Lisa Bergström. #Arlacares was based on the insight that Arla aims to impact the world in a positive way through dairy. "Creating the future of dairy to bring health and inspiration to the world, naturally..."
That is the vision of Arla. Our challenge was to create and present a design concept, involving a packaging solution with an integrated digital layer. #ARLACARES is a concept that collects and highlight all of Arla's work within health, social responsibility, reduced environmental impact and ongoing projects in developing countries under one name. It includes the target group and shows that company and consumer cares and makes change together. Our concept was awarded third place out of ten teams with the motivation: "We like the whole idea of the role that the brand can take in our society. Arla makes an impact both locally and globally. Arla takes a clear and long-term responsibility. Digitally we think there is a great benefit in going through a well-used platform to create engagement. It is more a strong communication concept for the Arla brand than for the product. The group has captured Arla's DNA." Berghs "Här är lösningarna som tog studenterna till Arlas ledning"